Walt Disney Studios Home Entertainment Celebrates Spring Solstice with the Announcement of an Exciting New Adventure! discovered by Lizzy, and as their different worlds unite, Tink evelops a special bond with the curious girl in need of a friend. Disney Fairies has become one of the Walt Disney Company’s most successful franchises -- driven on multiple platforms and across numerous business units of The Walt Disney Company, including Disney Consumer Products, Parks and Resorts, Disney Interactive Media Group, and Disney Channel. a Blu-ray Disc plus a DVD in a single package. Walt Disney Home Entertainment is distributed by Walt Disney Studios Worldwide Home Entertainment, Inc., a recognized industry leader. Walt Disney Studios Worldwide Home Entertainment is the marketing, sales and distribution company for Walt Disney, Touchstone, Hollywood Pictures, Miramax, and Buena Vista Blu-ray, DVDs and Digital Downloads. America, EMEA and Asia Pacific. Fans have created more than 25 million personalized Fairy avatars to date that can take flight in the virtual world of Pixie Hollow. Disney theme parks have also launched a Pixie Hollow attraction where fans can meet the Disney Fairies. The Disney Fairies are highlighted in the production of Disney On Ice presents Worlds of Fantasy, and additionally, Tinker Bell is in four other Disney On Ice shows touring the world. 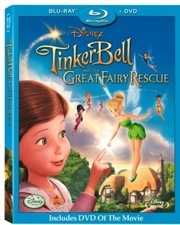 Following the success of Walt Disney Pictures Tinker Bell on Disney Blu-ray and hi-def DVD, Disney released Tinker Bell and the Lost Treasure in 2009 as the second title in the series. What an adorable movie! We really really love Disney around here. Ever since Gracie discovered the Princesses. :) And Tink was soon to follow. Gracie said she liked the movie and was very "into" it. She sat and watched it all the way through...which for my little bouncy buns is a major accomplishment. Wonderful movie! !